LiveTally Box 2 is designed for the latest generation of TriCaster : TC1 and IP Series VMC1. It delivers 16 closed contacts for both Program and Preview Tally information. It supports also the additional inputs provided with TC8000 Advanced Edition. LiveTally Box 2 comes with a software plug-in to be installed on the TriCaster and it is Plug and Play. Two LiveTally Box 2 can be connected to a single IP Series VMC1 in order to deliver 32 GPO/Tally triggers.GPO are available from 2xSub-D25 pins connectors. It can be used with any GPI based systems to trigger Tally cameras through CCU or equivalent devices. It can be used also to collect events from the TriCaster for third party switching log software. 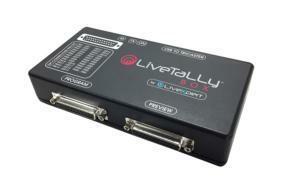 LiveTally Box 2 is also compatible with TriCaster Mini, 4xx and 8xx models with standard and Advanced Edition.